MOSCOW, November 29. /TASS/. 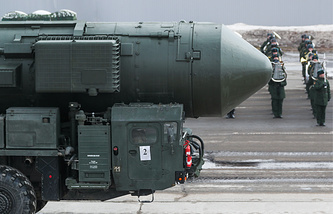 The first regiment of the Kozelsk missile division of Russia’s strategic missile force has been rearmed with silo-based missiles Yars and will enter combat duty next week, a source at the Defense Ministry has told TASS. "The first regiment of the Kozelsk missile division (stationed in the Kaluga region), has been rearmed with the silo-based missiles Yars. The regiment will enter combat duty next week," the source said. Earlier, strategic missile force commander Sergei Karakayev said the Yars missiles will be delivered to four missile regiments in the Kozelsk, Yoshkar-Ola, Novosibirsk and Irkutsk divisions.